My name is Jennifer Van Sant and I would like to tell you quickly about what lead me to stumble upon your web site on Christmas Eve. 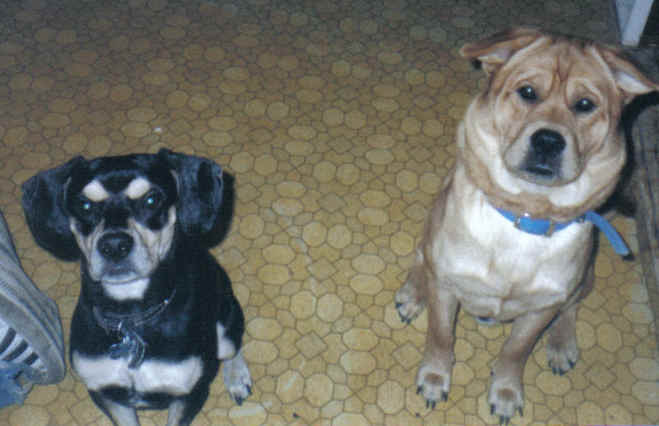 My dogs, Ozzy and Buddy, were inhumanely (to me), but humanely (to them) euthanized without my permission or notification. My sweet dogs were two and three years old. They were just babies and never hurt anyone, or did anything wrong aside from getting into the trash and having an accident here and there. They were my life and my family. To me, they were murdered. I found out the were put to sleep on Christmas Eve by the Humane Society, because "they were vicious". It's funny I never had a problem with them, or either did anyone else. I called the Humane Society on two occasions after it happened: the first is when I found out what had happened, and all they could say was they were sorry. They did not know anyone wanted them. The second time I spoke with the dog warden because I wanted to know why it happened, or just any information I could get, and again all I got was just a cold-hearted, "They were vicious. I am sorry we didn't know if anyone wanted them. We even kept them for 4 days." I don't really know why I am telling you this. I think it's just to get it out, or even to know your views on this. This is hard to deal with, because they had their lives taken away from them, because someone thought they were too vicious. They were my babies! How was it their choice? Do they think they are God, and have a right to choose who gets to stay on this earth and who should go? And maybe they say, "Go!" just because they are having a bad day, or did they even think about it. Maybe my puppies were just scared? No, I don't believe they think at all, and they are supposed to be there for the animals. I guess it's just the "good ones" they allow to live, the ones who look like they could be loved, right? I don't know! Anyways before my babies were taken from me I wanted to open up a NO-KILL animal rescue. Now I am going to open one up in their memory, and the memory for all who had their lives taken away from them. I just wanted to know if you knew of any programs that they have that would help out with this or what you think I should do, or just any comments would be nice thank you so much! !